Crow Patrol: on the rooftops! 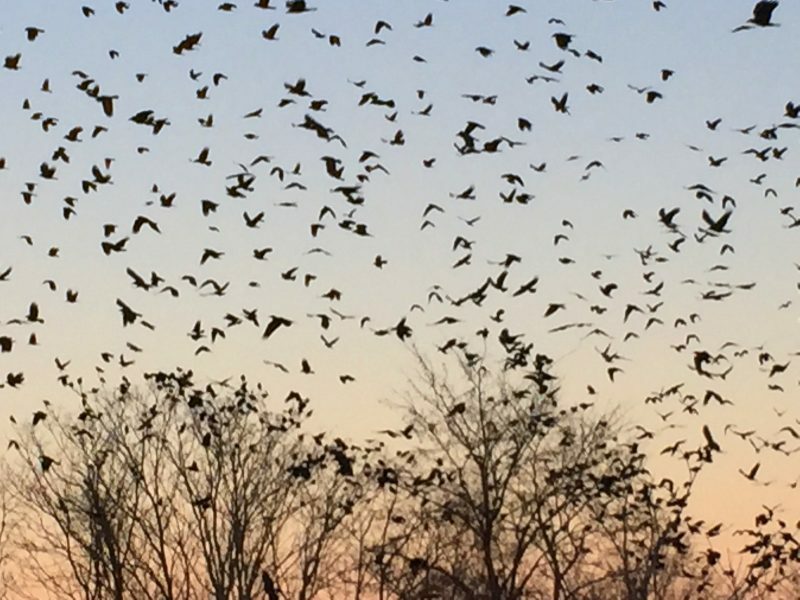 Last night it was just Bob and I – like date night out – watching the crows. We looked out from Riverfront State Park on Everett St. – no crows. 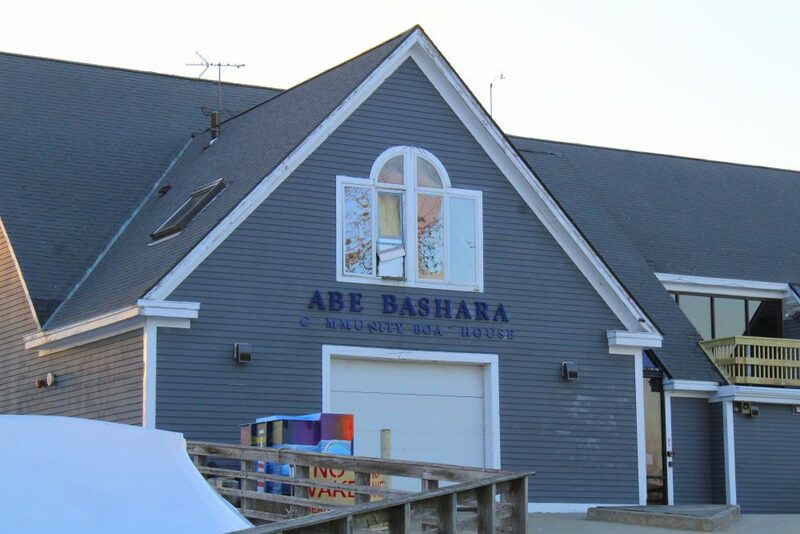 We then went to the Bashara Boathouse at 1 Eaton St. – one crow on the ice but others streaming across the river, from the north, over the trees far to the left. Off we went on patrol. We drove through Industrial Way off Andover St. – no crows. We went back to Andover St. and kept driving west and could see crows staging here and there. Andover St. at the Andover town line becomes River Rd. Now does that make sense? Now many were streaming to our left (south) and heading into the wooded areas especially along the power lines. We went beyond the road into Andover Place, beyond the Vocational School and down Old River Rd. We found maybe 500 crows milling around. 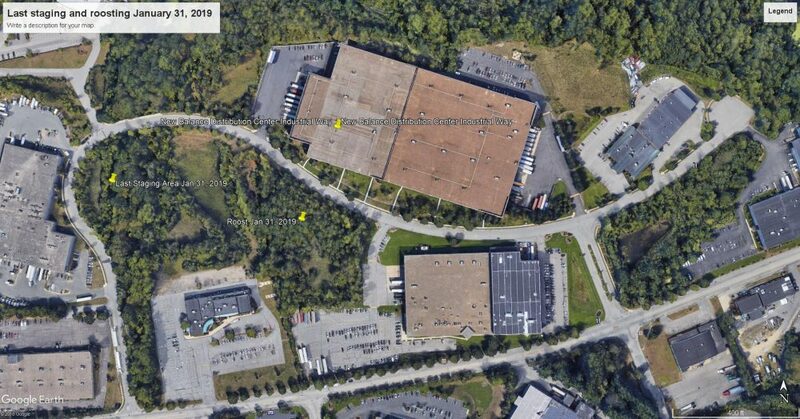 Back to Andover St. and up the street to the east of the powerline into an industrial park. Lots of crows everywhere – most sitting atop the tall leafless trees. A few feeding on an ornamental apple or cherry. At first, I thought they were going to roost here but it was not beyond sunset. 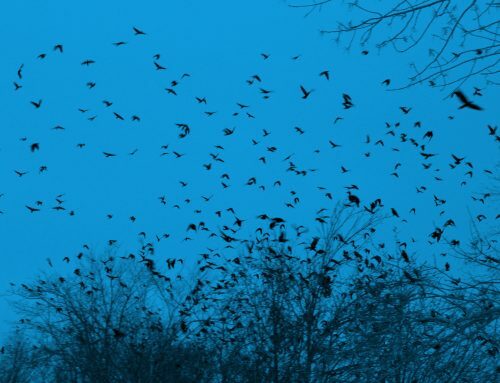 Suddenly at sunset, thousands of crows lifted and flew across Andover St. into the trees on the westerly arm of Industrial way. We drove down Industrial Way beyond Joseph’s bakery into the loop that goes to Simpsons and turned to face eastward. There are two big buildings here that have very few cars parked around them. A car pulled by us and suddenly he was back. Now some might say what are those two elderly folks doing there? Well, I question “elderly” !!! but, I surely wouldn’t question anyone trying to figure out what we were doing. We put down the window and said we were watching the crows. It always works. Folks then tell us aren’t they amazing, figure out we are some strange people to be sitting out on a cold, cold day watching crows and drive off! Back to the crows – My, oh, my what a conflagration on the tree tops ahead of us. Crows kept pouring in and pouring it from the west. They were so noisy. Now after 5:15 pm and the light is dropping fast. Much to my surprise the crows suddenly started to disappear further eastward. So off we went following them. We thought they might be heading back to the ice – their destination the past few nights but, no, there they were in much shorter trees right across from the large New Balance Distribution Center. They were so dense. At this point, we went back to the Boathouse to check to see if they were on the ice – not a one. 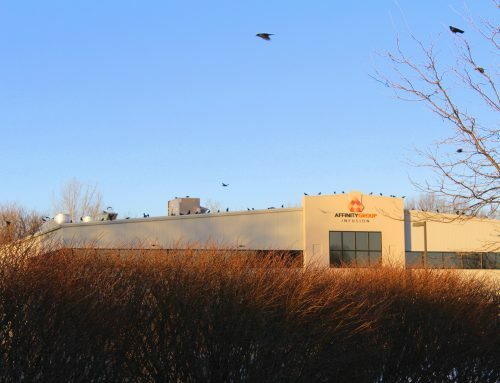 Back to New Balance and this time thousands of crows are pouring off the roofs of the two buildings. 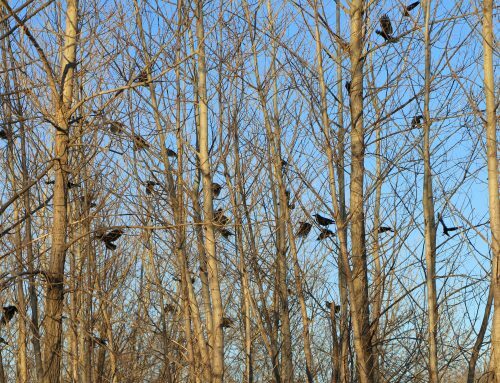 On and on the stream of crows continued, how could those trees accommodate more crows? We looked at them from all angles and there they were tightly packed in for the night still noisy but with some very different noises. 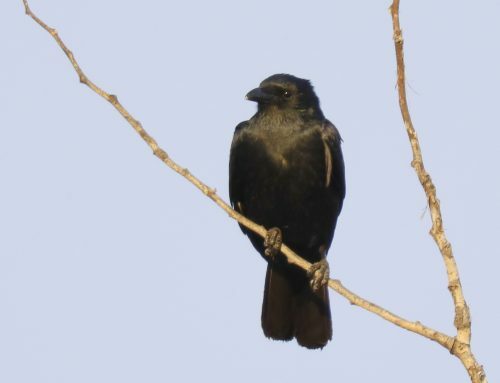 We only have a month and a half more for this phenomenon as some of the migrant crows will begin to move north to their nesting areas –someday we hope we will be able to determine where…..and the residents will just stay on their territories at night as they care for their nest, eggs and young. Please plan to come soon! Come on a weekday to see the Crow art exhibit at the Essex Art Gallery at 56 Island St. open 10-6 until March 15th. Visit some of our local restaurants – they are great. 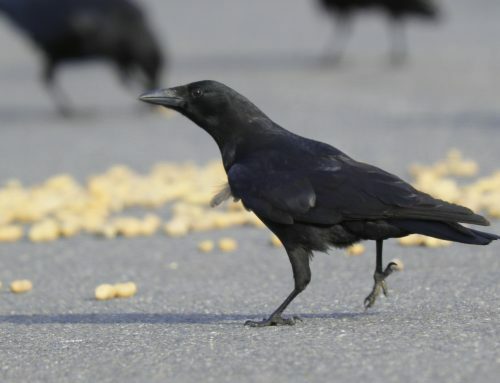 Be sure to check the blog for the latest postings on where the crows were last seen and let us know of your experience.